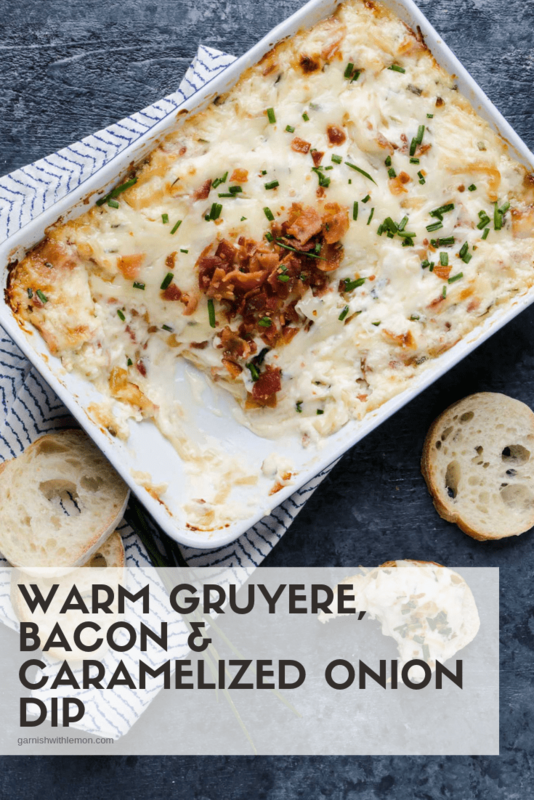 This Warm Gruyere Bacon and Caramelized Onion Dip is always one of the first foods gone at a party. You know those recipes that are your go-to’s for a casual party? You think about removing it from the list, but it’s just too popular to replace? 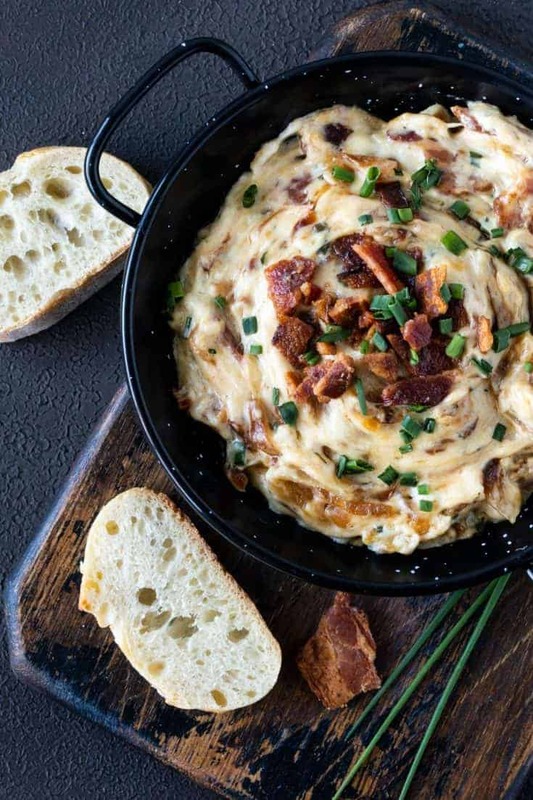 This Warm Gruyere, Bacon, and Caramelized Onion Dip is a perfect example. Um, hello? How can that not be spectacular? The flavors together are amazing, and it has just the right cheesiness without being messy. If that isn’t a win-win, I’m not sure what is. How can I say that something with caramelized onions lends itself to easy entertaining when caramelizing the onions themselves takes a while? Trust me, they are perfect because you can make them months ahead. They freeze beautifully, so make them now, pop them in the freezer, and you’ll have caramelized onions on hand that you can toss into recipes in no time flat. Recipes like this Flatbread with Goat Cheese and Caramelized Onions. See where I’m going with this? Using the same ingredient in a few dishes and making the appetizers easy for your friends to eat are keys to low-stress entertaining. Batch cocktails are great to serve at parties. All of the heavy-lifting is done ahead of time and you can be a guest at your own party. These Blood Orange Margaritas are one of our favorites! 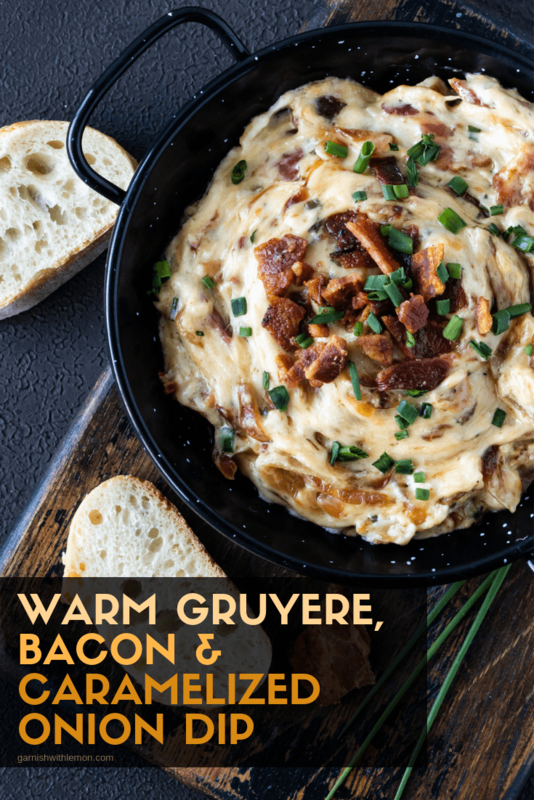 This Warm Gruyere, Bacon and Caramelized Onion Dip recipe will be the star of your next party! Swirl the olive oil in the pan and add the onions. Cook on low for 20 minutes, sprinkle onions with sugar and cook on low for an additional 45 minutes to one hour. Stir occasionally so they don’t burn. In a medium bowl, mix mayonnaise, sour cream, bacon, 1 tablespoon chives, salt and pepper until well mixed. Stir in shredded Gruyere and caramelized onions. Place in one quart baking dish, sprinkle 2 tablespoons Gruyere on top and bake for 20 minutes or until bubbly. Sprinkle with remaining chives and serve warm with crostini or crackers. If you are using frozen caramelized onions, simply thaw and add to the rest of the ingredients before baking. I think I need to make this for game day tomorrow! What could you replace the mayonnaise with? I haven’t tried to replace the mayo in this dip so I can’t speak to replacements. As a general rule, you can replace mayo with sour cream or greek yogurt. Let me know how it turns out! Good luck! May I ask, why canola Mayo specifically? Does it matter? We use Olive Oil mayo mostly. I can buy it of course- even Organic I believe, but if I don’t need to buy different mayo just for this recipe, I’d rather not, so, thought I’d ask. TIA!! You can use whatever mayo you like, that was what I had on hand! Enjoy! Thanks Ally! I’m glad it was a hit-thanks for your note! This looks like and AMAZING combination of all of the best foods! This will definitely be coming with me to our next holiday! Any suggestions for a substitute for the mayo? You could try Greek yogurt. I haven’t made it that way, but it should work. Let us know how it turns out! Amounts for mayo and sour cream are “?” …how many cups of each? They are both 1/3 cup. The recipe has been updated, thank for catching that! Can olive oil mayo be used instead of canola? Yes! I use it all of the time! Enjoy the dip, it’s one of my favorites! If I don’t eat bacon, can I sub mushrooms for that? That sounds delicious! I have not tried making it with mushrooms, but the flavors should work. Just make sure you drain the extra liquid off the mushrooms after you cook them so you don’t have a runny dip. Let me know how it turns out if you try it! Mushrooms absolutely work, and with the bacon too. I take frozen mushrooms (the frozen part is important), and I mince them up and throw them in with the onions in the last few minutes of caramelization. You can’t really taste them in the final product except that it adds yumminess. I also add in fresh thyme leaves at this point, and fresh thyme on top with the chives before baking. 15 cups of onions …? ?is that right?? Looks delicious though but seems like a lot if onion???? Hi Lynn, it’s 3 1/2 cups onions! Enjoy the dip! can I make this in the afternoon, keep it wrapped in the fridge and then bake it in the evening (when my guests arrive)? Absolutely! Just add a few minutes to the baking time if it is starting in a cold dish. Enjoy! Can heating in the microwave work? I’m bringing it to a Xmas eve party tonight. What do you suggest for re heating? Hi Debra, I suggest reheating in the oven at 350 degrees. It will probably take between 15-30 minutes depending on how cold it is. Happy holidays! Think it would work in a crock pot? I have never tried to make it in a crock pot, but would definitely be worth a shot. Just be careful that it doesn’t burn. Let me know if you try it! I want to take this to a party where it will likely be sitting out for a few hours as we all mingle. Will it still be good as it cools or does it become lumpy and hard to scoop? It will still be good as it cools, but it never lasts long at our gatherings! Enjoy! Hi. Can you tell me roughly how many this feeds? Thank you! Making it for Christmas Eve! I would say 8 when you are serving other snacks. Enjoy! I am eager to make this but have a question re: Canola Mayonnaise. Why Canola as opposed to Regular real Mayonnaise. Canola Mayonnaise is full of very unhealthy stuff. Can Real Mayonnaise be used instead. Hi Kathy, Feel free to use whatever kind of mayonnaise that you prefer. It will all taste amazing! Enjoy! I have made this amazing dip twice now and all my friends adore it! Thanks for the awesome recipe! Hi Julie, I have had success using either kind of onion and I slice them thinly, not chop them. Enjoy your test drive, this dip is one of my favorites! I just made the dip, great recipe. I added a little yellow mustard and it gave that extra something, something it cut the sweetness of the onion and gave it a little tartness. Overall, delicious recipe. Delicious recipe! I love that it makes a small dish. Some recipes are so large. Our dinner party of 4 loved this. The cook time is spot on. Low and slow makes a much better caramelized onion. So happy you love it as much as we do! I would just freeze the caramelized onions and the bacon crumbles separately. Then the last minute prep is minimal. I worry about the cheese separating if you freeze it all. Let me know how it works! What size dish did you use for baking? A small 7 inch baking dish or a pie plate works great! Made this today for my book club and it was completely gone. It was so good! I’ll definitely make this again. This is one of THE best dips I’ve had in a really long time. It is so rich and full of flavor. My family loves it too. This will definitely be in regular rotation at our house. Thanks so much for sharing this great recipe! 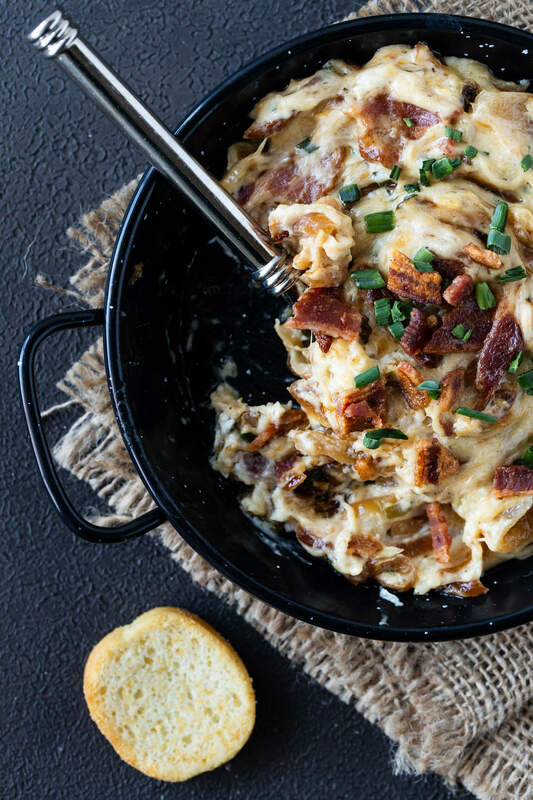 This dip is crazy good and easy to prepare ! I brought it to a party and it was gone within minutes. People were literally crowded around the dish. I will definitely be making it again. I added red pepper flakes to give it a little kick. So yummy!!! Thanks for this great recipe. I both bless and curse the day I first made this recipe, because ever since that day I am forced to make this dip for every single gathering I host or attend. Seriously, people cannot get enough. In fact, I have now had to quadruple the recipe because it goes so fast. I have altered the recipe somewhat, but I think the original greatness still shines through. My friends have dubbed this the “Dip of Awesomeness”. Can any kind of onion be used, i.e., regular yellow onions or red or white? And yes, this dip is AWESOME! It disappears off the table in minutes! I’ve never made it with red onion, but yellow or white work great!